BNP acting secretary general Mirza Fakhrul Islam Alamgir on Thursday said people will show their ‘no-confidence’ in the current regime through casting votes in favour of the sheaf of paddy in the municipality polls. Addressing a street rally in the town, he also said people will prove on December-30 by electing BNP candidates which party is the most popular in the country. At the rally, the BNP acting secretary general sought votes for his party’s mayoral candidate Towhidul Islam in Panchagarh municipality polls, UNB reports. Earlier in Nilphamari, the BNP leader termed the municipal elections as a challenge for protecting democracy. He came up with the remarks while speaking at the party office in Syedpur upazila before attending electioneering for BNP-backed candidates in the district. 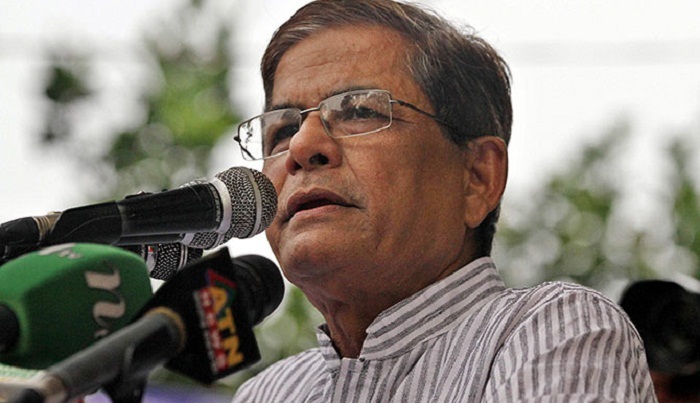 Fakhrul said BNP will not boycott the December-30 polls under any circumstance no matter what. He also alleged that a level-playing field is not created yet for BNP as the party leaders and workers are facing unnecessary harassments and obstructions. Later, Mirza Fakhrul joined the electioneering and distributed leaflets seeking vote on behalf of incumbent Syedpur municipality mayor and BNP candidate Amjad Hossain Sarker. The BNP leader also campaigned for the party candidate Fahmid Faisal Chowdhury Comet in Jaldhaka municipal polls. Earlier, Fakhrul came to Syedpur from Dhaka by a flight of US-Bangla Airlines to carry out polls campaign for BNP candidates in the northern districts.